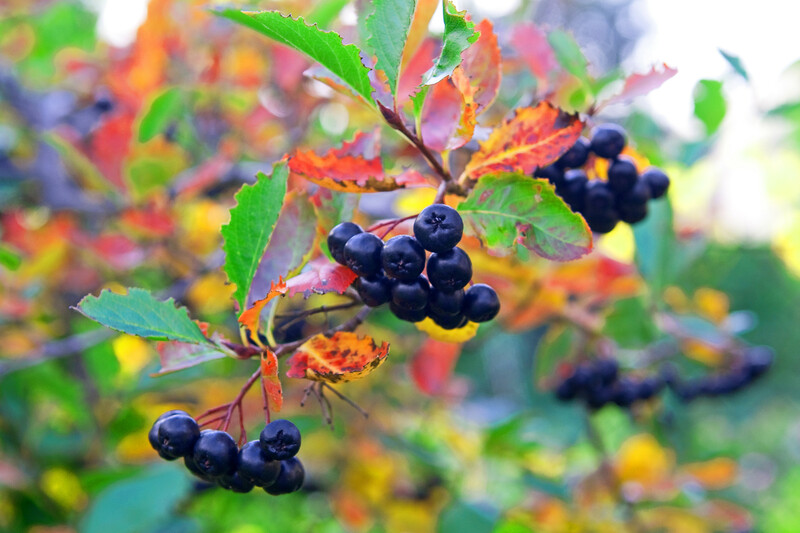 Black chokeberry is a North American native shrub that is very useful to both wildlife and as a healthy food for humans. The berries are a favorite of grouse, turkeys and other birds. Though quite tart, when sweetened the fruit is very tasty and good for you, being a strong antioxidant. Many medicinal benefits are claimed and practiced from using the extracts. They have extremely high antioxidative activity, are used as an anti- inflammatory, and are super high in vitamins ( A, C, D, B9, B2 and vitamin E) and beta-carotene. Growing from 3 to 10 feet tall, depending on the cultivar, chokeberry is an easy keeper being not fussy about moist or dry soils, PH, and light conditions from full sun to part shade. It can develop into small colonies that are simple to manage with minimal pruning and thinning if so desired. Along with the fruit is an amazing display of orange and red foliage in the fall. Several forms are available to suit the size of your garden or landscape. 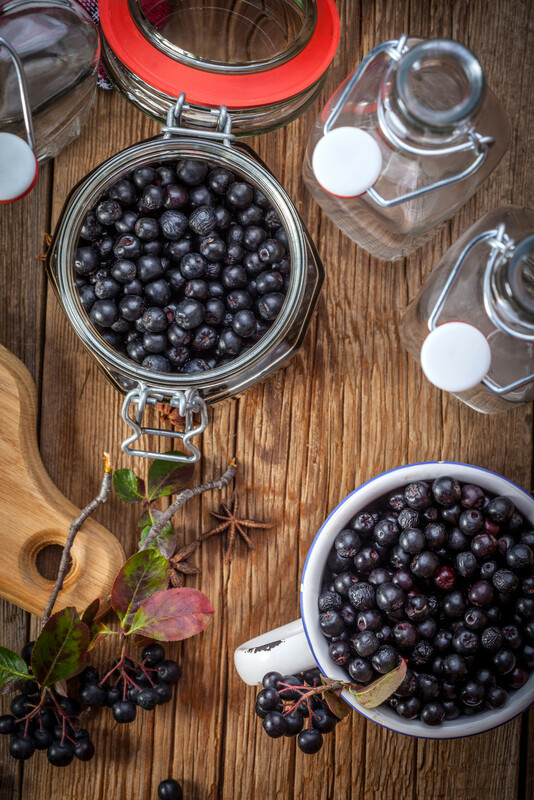 We tincture the berries and keep them on the pantry shelf for use through the winter. Accelerates recovery from heart/brain stroke (anthocyanins, phenols, vitamin P). Eyes: cures macular degeneration, prevents cataract, protects from UV radiation, improves vision (anthocyanin, vitamin P, beta-Carotene). Regulates thyroid and other hormones. Gastrointestinal: reduces inflammation, pain, cramping, stomach ulcers (anthocyanins) and stops diarrhea. Cleansing: Aronia binds heavy metals and radioactive materials and helps their excretions (beneficial in post-radiation therapy or accidental exposure to radiation). Disinfects wounds and dramatically accelerates healing time (helpful post-operatively) (biophenols, vitamins P, C and E). I am filled with pride. 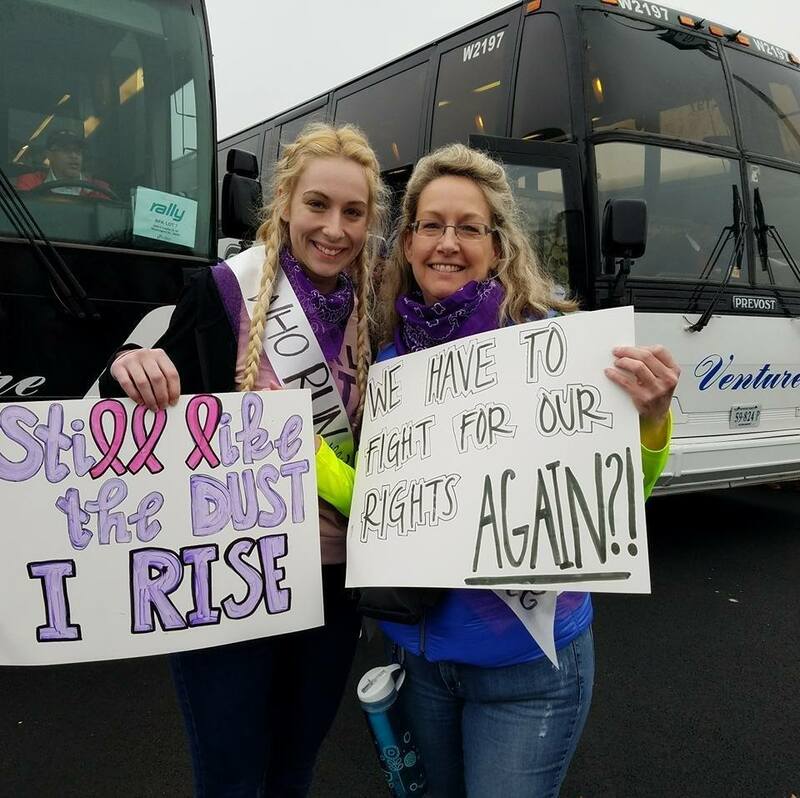 Attending the Women’s March was only one example of how these two practice citizenship. They do a range of big and small things each day….from writing letters to congressmen to volunteering with organizations who need help. They consider the needs of others, make conscious choices in the consumer world, and support a healthy and harmonious world for all….every day. I’ve witnessed it. They are an example to follow. They are to me, as Gloria Steinem put it so well, “the upside to the downside”. Thank you, dearest of friends, Kari and Rachel for putting your feet to the pavement and your voices to be heard on January 21, 2017. Now is the time we begin putting seed orders together for the vegetable gardens. Now is the time we look at our list of plants in stock for the nursery and we check our notes on all the plants we’ve propagated this past Fall. Yes, we still have some winter out in front of us. All of February, and depending on what kind of season it will be, the month of March as well. 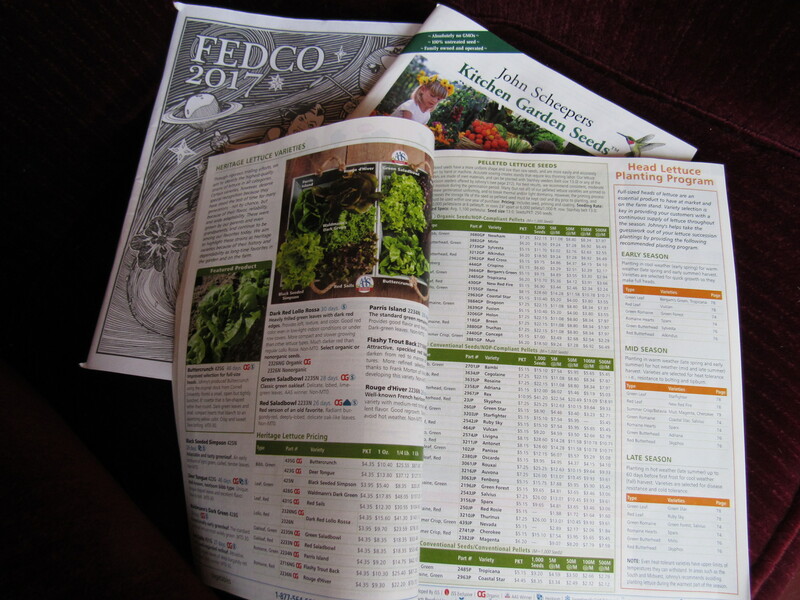 However, as we turn the page on the calendar (soon), we really do have the upcoming growing season on our minds. Rick has been very busy sourcing and also propagating some real goodies for the nursery. New plants that are sure to excite customers! I’m excited! Now is also the time a tiny feeling of panic sets in. Winter never seems quite long enough to get all the things that I’ve wanted to do completed. I need more time for walking in the woods, some more time ice fishing, of course way more time knitting and spinning (and dyeing and felting), and working on that pesky quilt that remains unfinished but in progress, as well as a list of household projects… and if we’d only get a good dumping of snow, more snowshoeing and sledding. Slow down winter! I need more time! The last few days, we’ve all had a nasty cold, but this wasn’t going to keep me from progress. It is impossible for me to lay around without noting some accomplishment at the end of the day. Don’t ask me why this is a problem because I really don’t know the answer. I wasn’t quite up to splitting wood or reshingling the back of the house, but I did organize the cellar, put some time into a pair of socks I’m knitting and made bread. 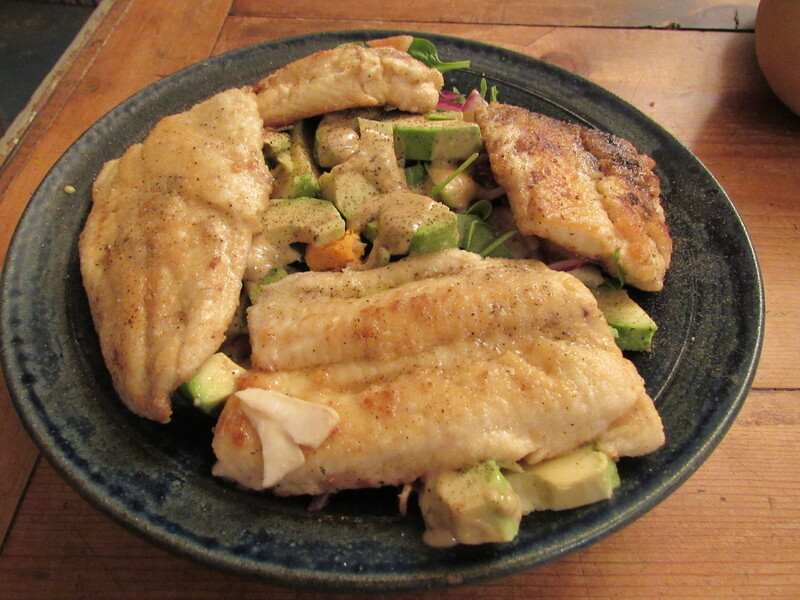 This, along with several cups of ginger tea, made my down days seem less down. 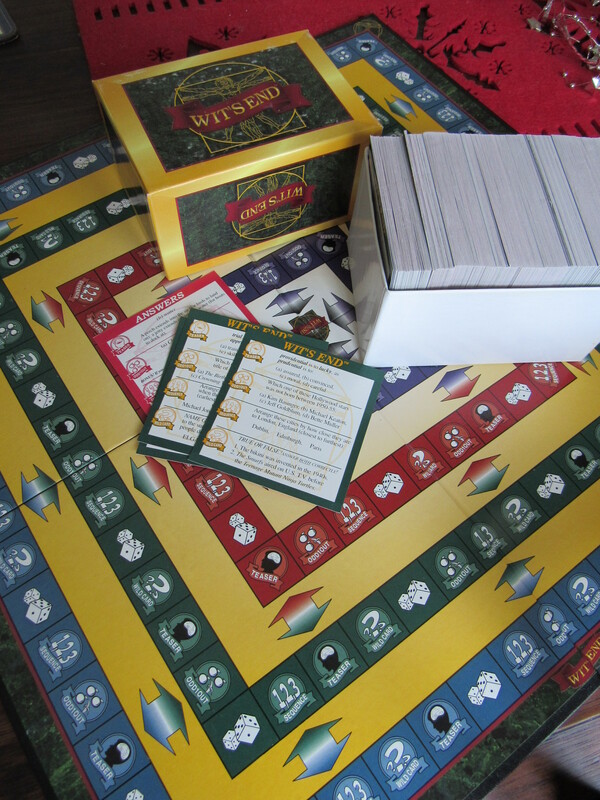 Now we all feel better and are expecting a group of friends over tonight for game playing. An evening of sitting around the table with friends, a collection of goodies and drink to keep our spirits up, and a good game, is yet another winter indulgence that we’ll have no time for come summer. 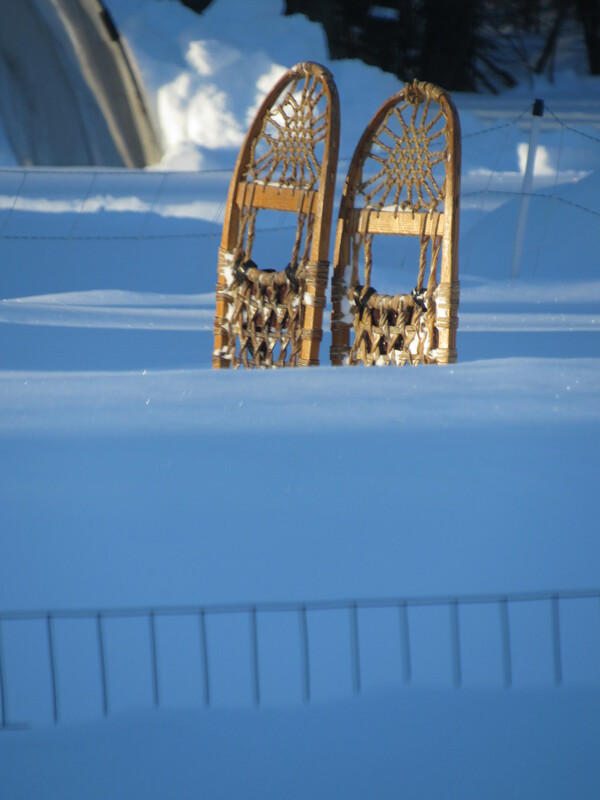 Yeah Winter…stay with us! What do you do during these winter months? 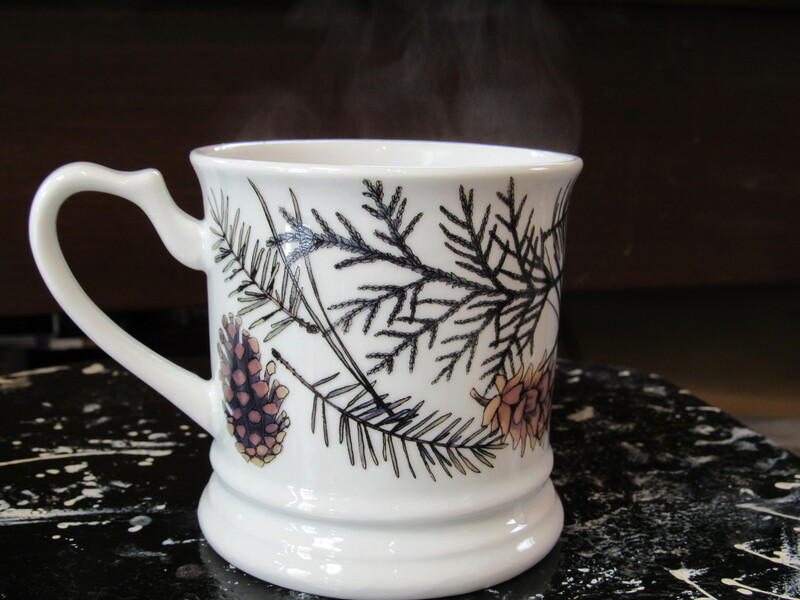 Do you have some winter indulgences or do you wish it to hurry up and be over? To tell. 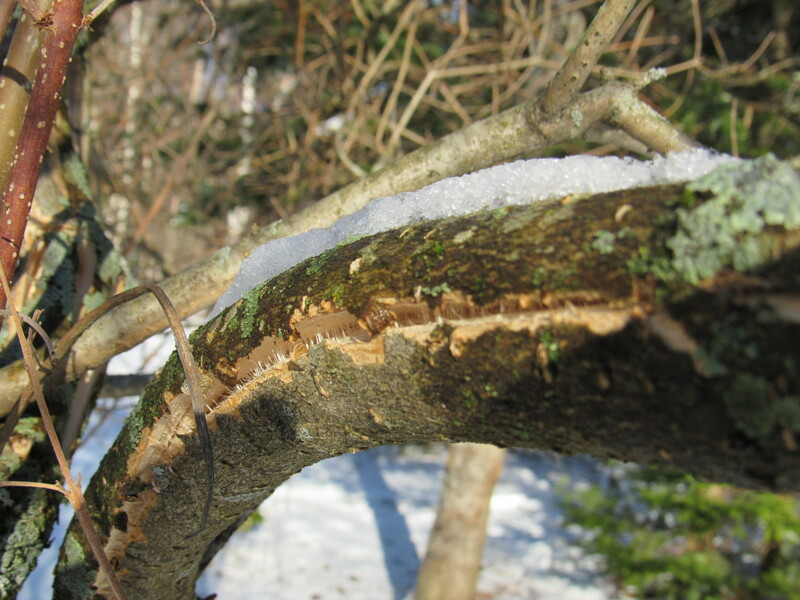 With the recent storms that have brought us a mixture of ice and heavy wet snow, many of us have had some damage to some of our most prized trees and shrubs. Several here have been bent right down to the ground with the top branches frozen into the snow and ice. Others have just had a branch or two bent over. When this happens, there is often a break or crack in the branches and or even in the main trunk. If the break is bad and all the way through so that that the piece is almost off, then maybe it is best to cut it off at the break. New growth should replace much of it in the next few seasons. If it is merely a crack and the bark is still connected on two sides, then it is possible to repair it. In the past, I have straightened the branch or small trunk to the point that the break is closed up and the bark is touching where the crack was formed. 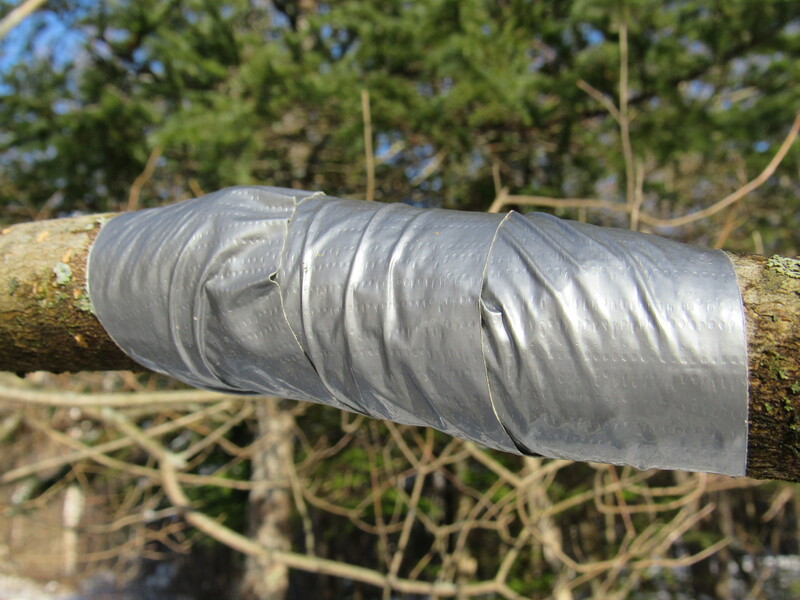 I then wrap it tightly with duct tape to hold the sides together. 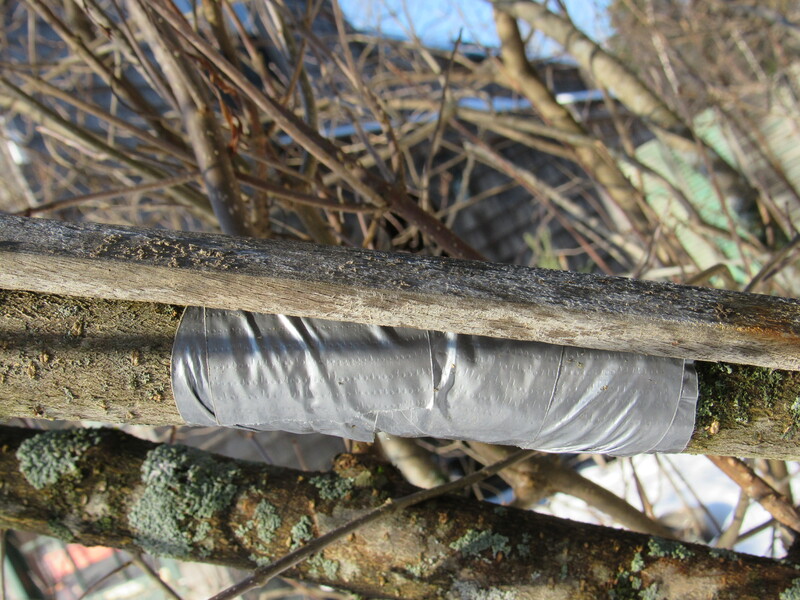 After that, I add a splint strong and long enough to keep the branch or trunk from bending again. On trunks, it may be necessary to stake them as well. It is important to do this as soon as possible before the bark dries out. The tape will eventually disintegrate and you will see the new growth push against and around it. We have saved several trees and shrubs this way, including a Stewartia and a Dogwood that are both now over fifteen feet tall (the pictures are actually of a damaged lilac). It looks like next weeks forecast is calling for more ice and freezing rain, which could bring even more damage than we’ve already had this year. This played on Maine Public radio this week. Something for all of us to consider, another great reason to grow a garden and to add native plants to your landscape. As our human footprint continues to increase, creating habitat for declining species is the least we could do. Please listen….not only a warning about the Rusty Patched Bumble Bee being put on the endangered species list but some curious facts about this amazing little bee! I apologize for the possible broadcasts you may hear after the piece on the bumblebee, not sure how to edit the recording! We are just about to begin our yearly 3-month yarn CSA ( community supported agriculture). 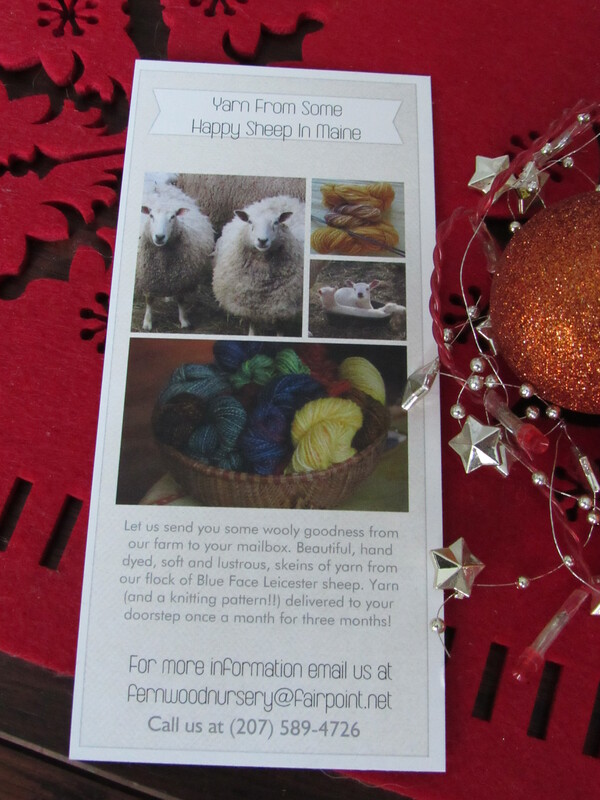 If there are any knitters who are short on yarn stash or simply want to knit something using some delicious Blue Face Leicester yarn from our flock…here’s your chance. 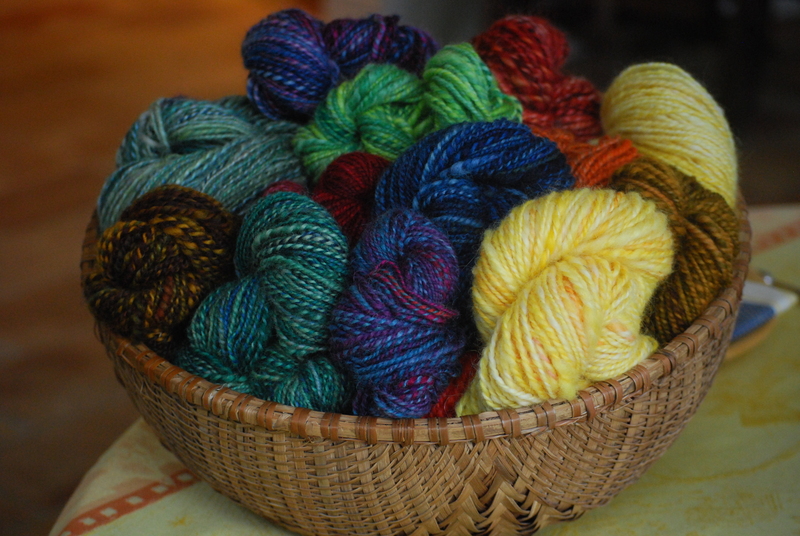 It’s soft and lustrous, hand dyed and all from our sheep here at Fernwood Nursery. 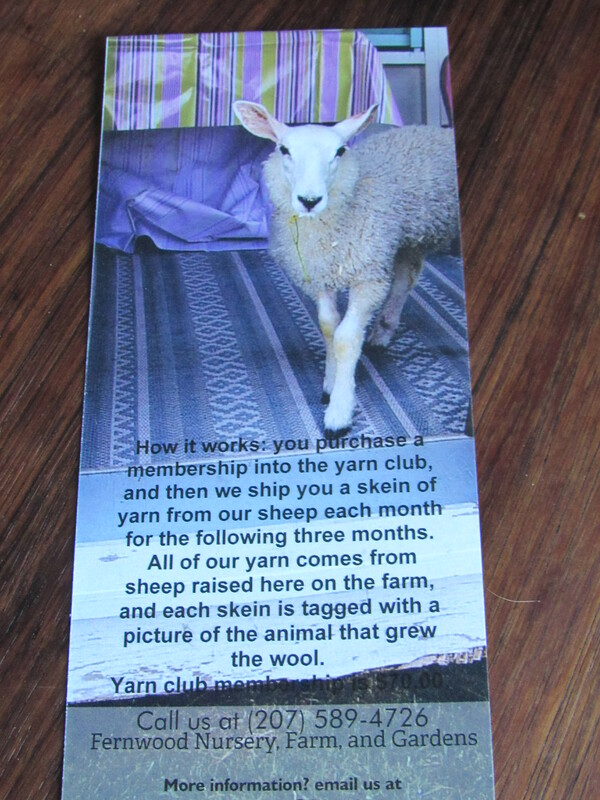 And, you actually get a little more than yarn…right to your mailbox!! Please email us at fernwoodnursery@fairpoint.net with any orders or inquiries. I’ll respond pronto! 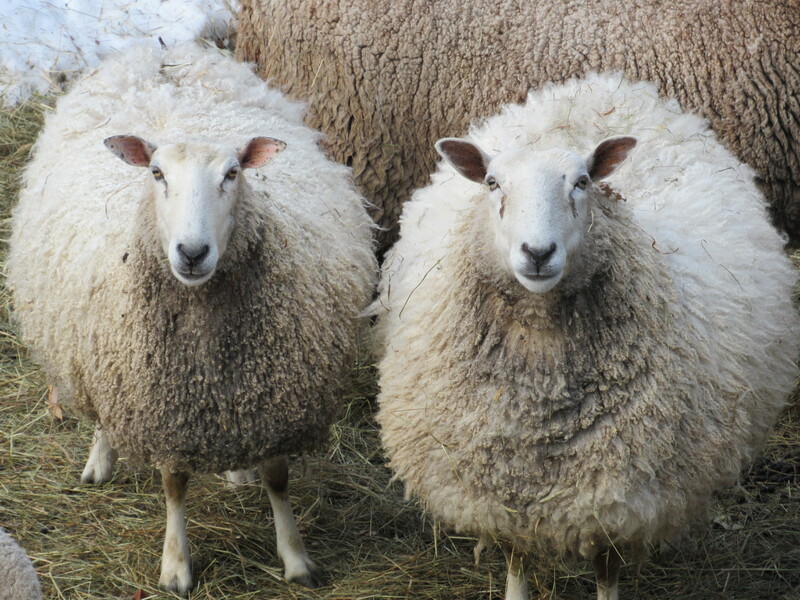 And the sheep here… well, they say “thank ewe”! On this first day of a New Year, what do we do? First, we shovel (again) after another good dose of snow, we eat a hot breakfast of farm raised eggs, homemade sourdough bread, and hot coffee, then we ice fish out on lake St. George and bring home a decent size salmon, we tackle a bit of sewing on the quilt that has been sitting for two years, and just before dinner we light candles and listen to Celtic music playing on our local radio station. Here’s to the New Year and ‘off to a good start’. 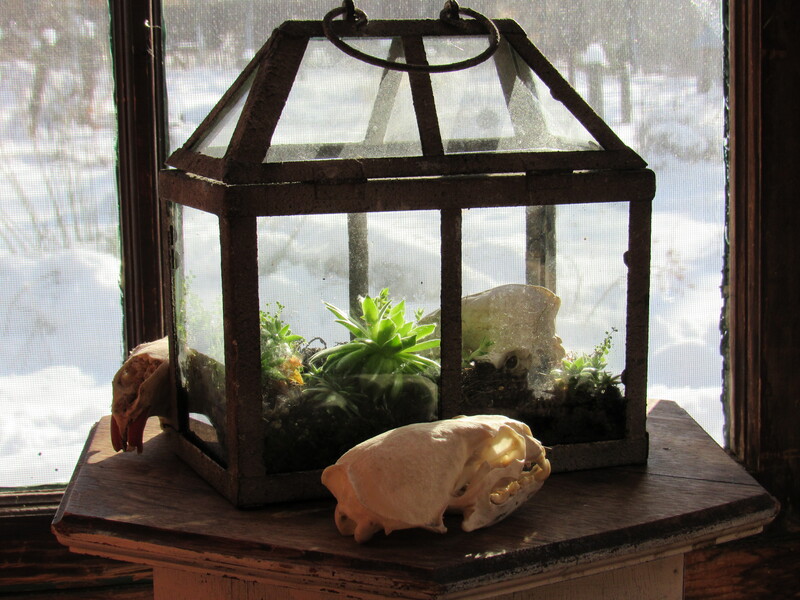 And…one more thing….some winter poetry by Marge Piercy. Enjoy. and the government. Please, no foreign wars. of quarreling past what can be sweetly healed. Keep our cats from hunters and savage dogs. as we skate over the ice of the new year.